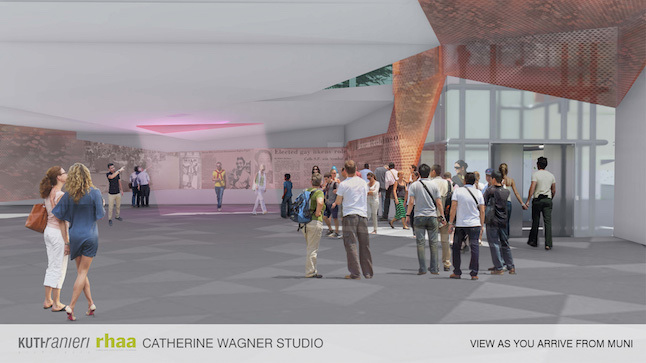 Earlier this year, it was announced that Harvey Milk Plaza would be undergoing renovations, with plans to field a design submitted by architects and artists. The process began in earnest earlier this year, as an anonymous donor gave $500,000 to kick the project off. Each design is fascinating in its own right, but what the jury is looking for is a design that remembers Harvey Milk. Andrea Aiello, director of the Castro/Upper Market Community Benefit District, shared her thoughts on the designs with SF Weekly. She said, "All three proposals are very different, yet each speaks to Harvey in a different way." As you and I and anyone who's been to the Castro knows, Harvey Milk Plaza is also a transit center that sees pretty heavy usage throughout the day. So in addition to "inspiring people to learn more about Milk," as SF Weekly puts it, designers had to make sure that their plans also accounted for frequent foot traffic and public transit stops. Perkins Eastman, one of the design/consulting firms, based their design on a "soapbox" of sorts, with an emphasis on activism and giving people a platform from which they can share their message, very much in keeping with Milk's life and legacy. 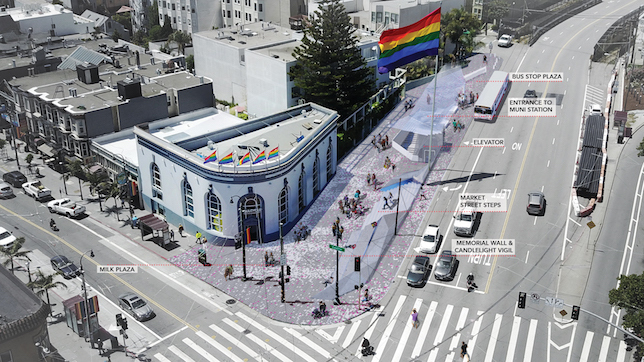 Part of their description reads, "A stepping and ramping amphitheater, set within a field of candles, transforms the corner of Castro and Market into a soapbox, not just for one, but for many." 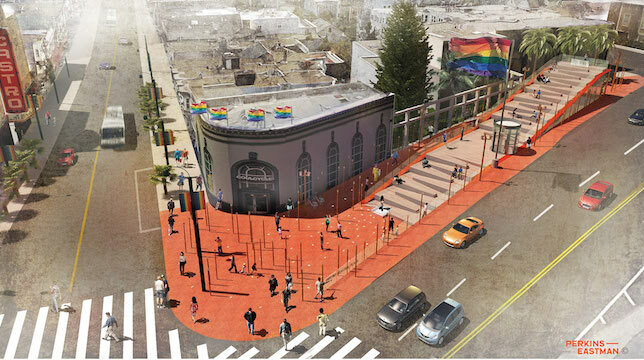 It's a pretty gorgeous design, and it includes a nighttime light installation, harkening to the candlelight vigil held in the Castro following Milk's tragic murder. Groundworks, another entrant into the competition, leans heavily on trying to teach passersby about Milk's legacy. They write: "The Memorial is a reflective and mirror-like faceted panel, adorned with his effervescent visage and his most moving and important quotes. It is intended to reflect the dynamism, individuality and uniqueness of all those who visit the Memorial and Plaza; all creeds, all races, all walks of life." They, too, chose to pay homage to the candlelight vigil with a somewhat more down-to-earth tribute where people can be a little bit closer to the lights themselves. Finally, Kuth Ranieri Architects' proposal "constists [sic] of a new street-level plaza incorporating a panelized ribbon of fluid visual content, a commemorative gesture that evokes the memory of Harvey Milk’s life and extends beyond the boundaries of the plaza to create a new gateway to the Castro." Theirs has to be the most unique, as it seeks to embed this "ribbon of fluid visual content" into a small, roofed space just outside the Castro Muni station exit. As well, they show that they're looking to use a striking variety of materials in their construction, which should make for a really intriguing presentation. The period for public comments has passed, and now it's up to the jurors (working alongside SFMTA) to decide on a final design. It's getting closer to the time when Treasure Island is going to be largely demolished to make way for a massive redevelopment project that has been in the works for over a decade.